Move your jelly pieces around the board by either duplicating up, down, left or right into vacant squares, or ‘jumping’ diagonally. Landing next to your opponent’s piece will claim it. Group 4 jellies together in a square formation to build a Jumbo Jelly. These jellies can move to any available square on the board and create a single locked piece which has an even greater duplicating power. Outsmart your opponent and leave them with no possible moves or finish with the most amount of pieces. Switch on the ‘Lucky Squares’ option and the game intensifies. Lucky squares can be either a jumbo steal, a lock dissolver or an extra move. Hidden within the board they will be revealed as you progress through the game. Will you be the lucky one or will your opponent land on them first? Lucky Squares add an exciting twist to the game. 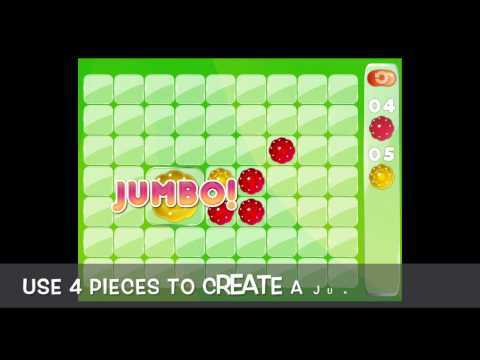 If you enjoy games such as Chess and Othello then you’re sure to love Jumbo Jellies.